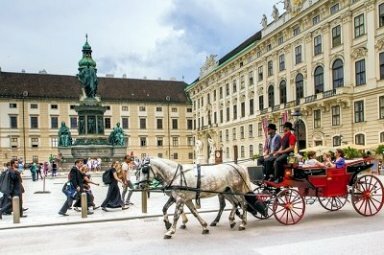 This is a Europe 10 day itinerary by rail which includes the imperial cities of Prague, Budapest, Bratislava and Vienna. 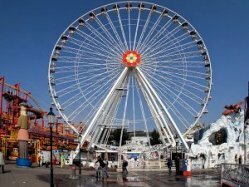 You can book this tour cheapest during winter time at a very good rate. 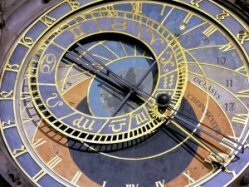 All cities offers great cultural and entertainment activities, such as operas, christmas markets or a superb nightlife. 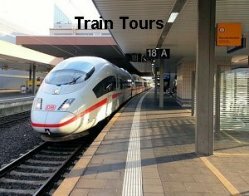 You should book such a trip earlier than 3 month in advance to get the best rates because rail tickets can be booked earliest normally 3 month prior to date. 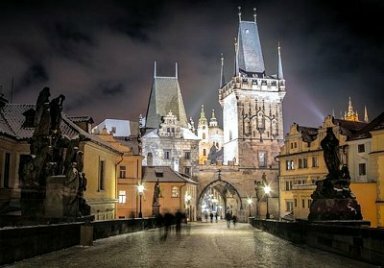 Prague is a perfect winter destination, here you'll find the triumphs and tragedies of 10 centuries spiked with the peculiarities of post-Communist reconstruction. Almost 90 years after native-son Franz Kafka's death, Prague's mix of the melancholy and the magnificent, the shadows and the fog of everyday life set against some of Europe's most spectacular architecture, still confounds all who live or visit here. It's tightly wound brick paths have felt the hooves of kings' horses, the jackboots of Hitler's armies, the heaving tracks of Soviet tanks, and the shuffle of students in passive revolt. memories or profits from a once-captive city now enjoying yet another renaissance. A turbulent past and a promising future give Prague an eclectic energy, while its baroque and renaissance atmosphere gives it gravity. 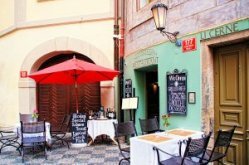 Prague remains a great value, especially it's dining, its culture, and its famous national treasure, beer. Budapest is having always a party - drawing visitors with a grandiose 19th-century attitude that built the majestic Magyar capital on the Danube into one of Europe's most cosmopolitan cities. 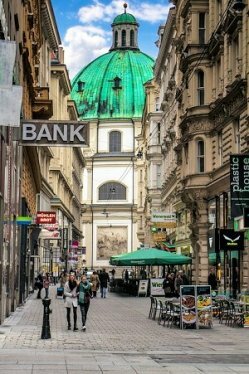 Budapest is pure fun, with its grand palaces, wide boulevards, warm Turkish baths, worldly restaurants, and wild nightlife feel closer to Paris and Rome than Warsaw - and at a fraction of the cost. cost. There are cheap, quick eateries all over the town, but the top restaurants offer some of the best dining values in Europe, so feel free to splurge. And be sure to take advantage of cafe life, nursing an espresso while people-watching at Gerbeaud's. 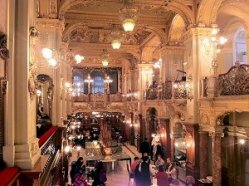 Hungary's popular 19th-century confectionery feels maybe too remodeled and the brew is a bit more costly than most, but this elegant place buzzes with enough bonhomie to keep you occupied for hours. Bratislava is the dynamic capital city of Slovakia. 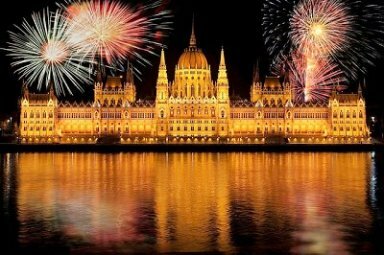 With its proud history as a coronation city for Hungarian monarchs, it combines the legacy of generations past with the challenges of modern times. The compact historical center with its many sights can be explored on a leisurely walk, preferably in combination with a stop at a cozy café, an inviting wine cellar or an elegant restaurant. 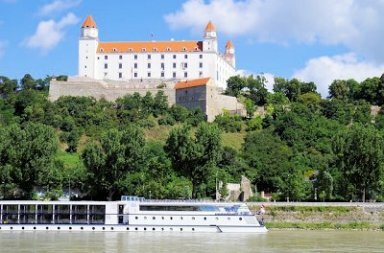 The “must-see” items are Bratislava Castle, St. Martin‘s Cathedral, Old Town Hall, Primatial Palace, and Michael‘s Gate plus a host of other magnificent palaces, churches, museums, galleries and fountains. The red city tour train with multi-lingual guide takes you through the historical center regardless of what the weather is like. The city has many special events every season of the year. Being in Vienna makes me wish I had a time machine so I could go back to the last half of the 18th century when the city resounded with the music of Haydn and Mozart and Empress Maria Theresa ruled from Schönbrunn Palace. Or maybe the first decades of the 20th century would be better, when Freud was developing his methods of psychoanalysis, Klimt was covering canvases with his Jugendstil figures, and Vienna was whirling to Strauss waltzes. left a rich architectural legacy of magnificent baroque and rococo buildings and palaces, beautifully landscaped gardens, and fabulous art collections from the corners of their empire. Therese was good as well. All of our guides spoke very good English and were very informative and helpful. I would like to thank you from the bottom of my heart for the trip you have organised for us. Every thing went off so perfectly I still find it had to believe. All the hotels were stunning and all the train, plane, taxis, walking tours, everything was done as expected without any problems. We have had a holiday of a life time and we have and will be sending all our friend to you to plan their trips for them. You deserve a big hug and kiss from both of us. Please let us know if there is anything we can do in return, maybe you have Facebook or something that we can write a review for you, please let us know. This is long overdue, but my family went on a trip to Europe and used your services. My sister-in-law, Kim Miller, highly recommended you, and we were not disappointed. The one aspect that especially struck me as superior service, was when my daughter and I were scheduled to drive a section of our trip in England. At the last minute... I mean the morning of... I chickened out and my daughter contacted you by email and asked if we could cancel the scheduled car rental. Not only did you cancel the car, but you emailed us back the schedule of trains that we would need to take to get us through the rest of our trip without driving. And all within an hour!!! I was so tremendously relieved and grateful to your fast and helpful service that I was able to relax and really enjoy the rest of our trip. I will recommend you to any of our friends traveling to Europe and we will use your services again. Karen T. and Molly K.